Aspartame-Acesulfame Salt is an artificial sweetener that is made up of two sweeteners: Aspartame and Acesulfame K.
It is 350 times as sweet as sugar. It is sweeter than either substance on its own (Aspartame 180 times, Acesulfame-K 200 times). In addition the taste is much closer to sugar without the aftertaste of either sweetener. During digestion the salt is broken down into its component parts, the Aspartame is metabolized as a protein, and the AcesulfameK is excreted by the kidneys. It contains about 3 calories per gram but only a tiny amount is needed and consequently any typical serving will contain approx zero calories. It is mainly used in the food industry as an artificial sweetener. It is a fine flowing powder, easy to store and work with, does not absorb moisture, and keeps for a long time. Aspartame-acesulfame Salt has zero calories per serving and zero glycemic index. This makes it suitable as part of a diabetic diet. All the same problems associated with Aspartame. Many people have reported side effects including headaches, dizziness, nausea and even blindness. In addition a by-product of the metabolism of aspartame is phenoanalyne and people with a genetic disorder called phenylketonuria (pku) are unable to metabolise it. Consequently all products that contain it must carry a warning on the label. Although artificial sweeteners contain zero calories, they do not always appear to be effective against obesity and diabetes. Statistical and clinical tests have repeatedly shown this to be so, though, until now the reason has been a mystery. However a new trial, conducted at the Weizmann Institute of Science in Rehovot, Israel and published Sept 17th 2014, sheds more light on the situation. It appears that these sweeteners affect the bacteria in the bowel in adverse ways. Tests showed impaired glucose metabolism in subjects, human and animal following moderate consumption over several weeks. More information is available in Science News. While further testing is needed, the results are indeed worrying. Perhaps these sweeteners have no role at all to play in weight loss and may be a poorer choice than regular sugar! The FDA has set a guideline Acceptable Daily Intake for Aspartame and Acesulfame equivalent to about 36 cans of soda for the average person. 64% Aspartame and 36% Acesulfame are added to an acidic solution and allowed to crystallize. Water and Potassium are removed. The resulting dry salt is a free flowing fine powder. 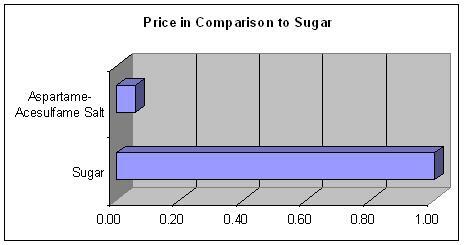 In effect the Aspartame replaces the Potassium in the Acesulfame K.
On the commodity market it is one of the cheapest sweeteners, costing about 6% the price of sugar for the same unit of sweetness. It was invented in 1995 by a sweetener expert named Dr John Fry. Approval in the USA carried forward from the two component sweeteners. Gained EU approval in 2006 as E962. Is useful for diabetics and it is harmless to teeth. However many concerns have been raised and side effects reported. Best advice would be to limit consumption or avoid altogether. It is better than Aspartame on its own because a typical serving will contain less of this potentially harmful substance. Pepsi are now replacing this combination with Sucralose and Acesulfame because of consumer concerns.